To make the kaffir lime mayonnaise, place the mayonnaise, lime rind and lime leaves in a small bowl and mix to combine. Set aside. Place the peppercorns and chilli flakes in a mortar and pound with a pestle until fine. Place in a medium bowl, add the salt and flour and mix to combine. Place the eggwhites in a separate medium bowl and whisk until foamy. Half-fill a large saucepan with oil and place over medium heat until the temperature reaches 180°C (350°F) on a deep-frying thermometer. Dip the fish, in batches, in the egg then place in the flour mixture, tossing to coat. Cook for 1–2 minutes or until golden brown. Remove using a slotted spoon and place on a wire rack to drain. 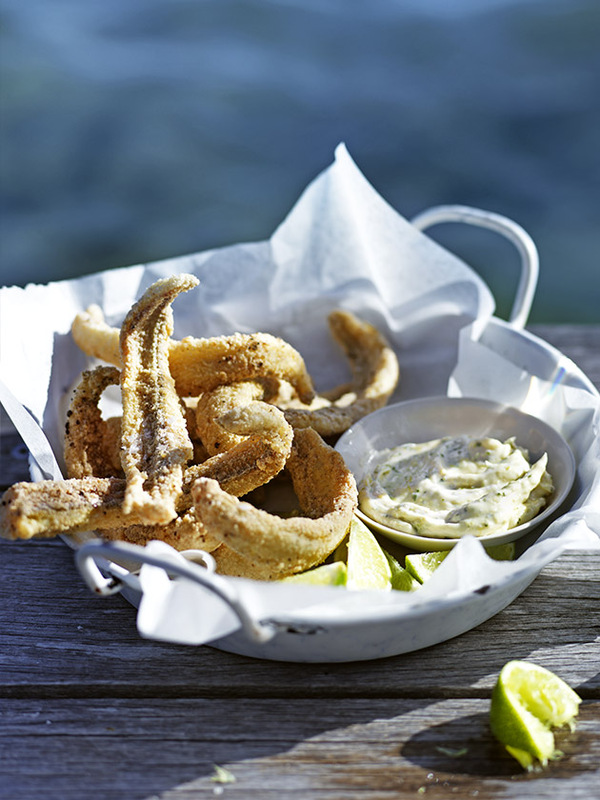 Serve with the kaffir lime mayonnaise and lime wedges. Serves 4. + We used whiting fish fillets, but flathead or snapper will also work well. Wine note: the delicate flavour of whiting with an accent of lime makes it a perfect match to the Cloudy Bay Sauvignon Blanc.